Family Volley: FAMILY FUN FRIDAY - Balloon Balance! FAMILY FUN FRIDAY - Balloon Balance! Time to round up your family and have some fun. Gather your cookie sheets and balloons. You will want to blow up a balloon for every person. And a few extras because if your house is anything like our house, someone will pop one before the game begins. Divide your family or group, into two teams. Form two lines on one side of the room. Establish a "pick-up" line on the other side of the room. 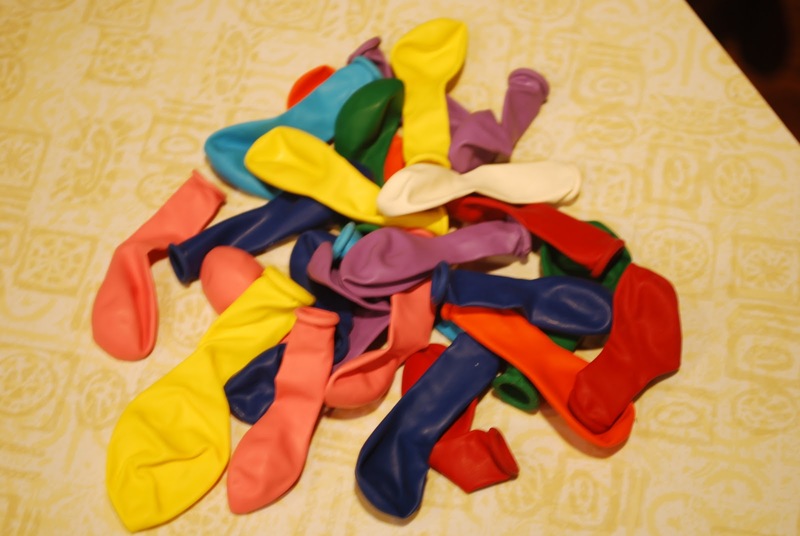 Place all the balloons but one (for each team), at the "pick-up" line. At the starting line, where you have your two teams lined up, have the first person hold the cookie sheet and place one balloon on the cookie sheet. When you say "go" the first person has to go across the room with their balloon on the cookie sheet, WITHOUT LETTING THE BALLOON FALL OFF. Once they get to the "pick-up" line, they have to bend over, get another balloon, and carry them on the tray WITHOUT THEM FALLING OFF, back to the starting line. They then have to pass the cookie sheet, WITH THE BALLOONS ON IT, to the next person. The second person on each team then has to walk back across the room to the "pick-up" line, get another balloon, and carry all three back to the start line and pass the cookie sheet to the next person. THE GOAL: to get all the balloons on the cookie sheet and carry them back and forth without letting any of the balloons fall off. RULES: You decide how you want to play. You can either use your hands or other body parts to help keep the balloons in place as you walk, or you can't. Up to you. You can also change this rule, depending on who is playing. It is a good way to make things harder for older kids and adults, and easier for younger kids, so everyone can play together. You also decide what to do if a balloon drops. You can either make the team start over from the beginning with only one balloon. Make the person bend down and pick up the balloon and start back up where it dropped off, or make them start that lap over. You decide. Whichever team does it first, wins. Summary: Walk across, pick up a new balloon, walk back, pass the cookie sheet. Walk across, pick up another balloon, walk back, pass the cookie sheet. Never let the balloons drop. If your family isn't very big, or if you don't want to form two teams, you don't have too. Instead have each person play and time them. Whoever has the fastest time wins. You can also play that whoever can carry the most balloons without them falling off, wins. If you are playing with younger children, let them use their other hand to hold the balloons on the cookie sheet or cardboard as they walk. 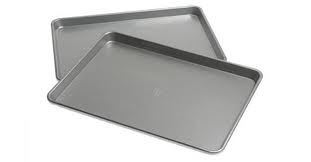 Instead of each person carrying the cookie sheets across the room AND back, each person can just carry the tray one direction, then pass the cookie sheet to the next person. If you go this route, just have the teams split up and put some of each team on either side of the room when you start.